The VCF is particularly active in fighting this threat and is implementing a number of projects across Europe including many actions against poisoning. We have also reported several times the dramatic episodes of poisoning affecting African vultures, in what is already known as the African vulture crisis, leading to several species being considered critically endangered. But the illegal use of poison occurs elsewhere too – as a tragic occurrence in Argentina shows. 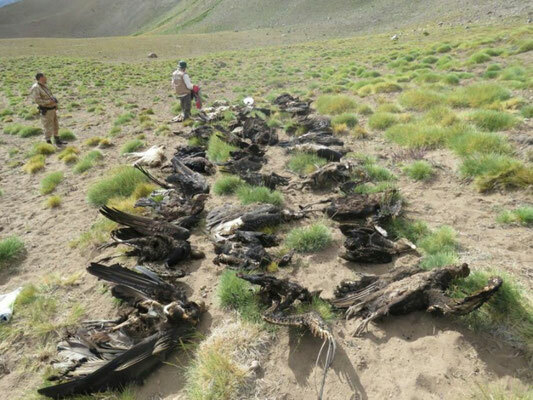 At least 34 Andean condors (20 males and 14 females, and almost all adult birds) were found dead, apparently by poisoning, in a locality south of Mendoza. Andean condors (Vultur gryphus are very large new world scavengers, that occur all along the Andean chain, from Venezuela to the Tierra del Fuego. With only about 6700 individuals left in the world, the species is facing rapid and steady population declines across its range, so this incident is significant and dealt a blow to the populations of the species in Argentina – in fact, it is the incident with the most massive mortality of Andean condors ever registered! 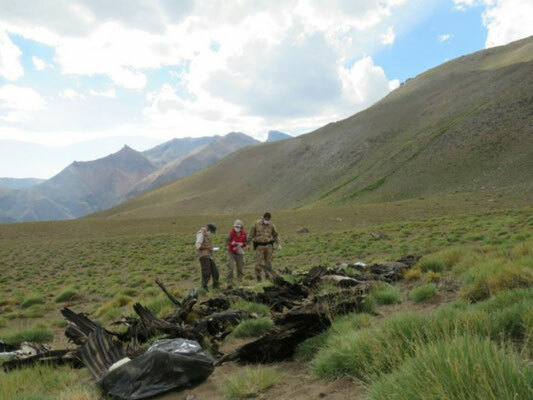 The discovery was made by a resident of the area, who alerted the authorities and the BioAndina Foundation, which specializes in the protection of the condor. The site of the incident is almost 3,000 meters above sea level. The corpses of the Andean condors were stacked and partially burned. 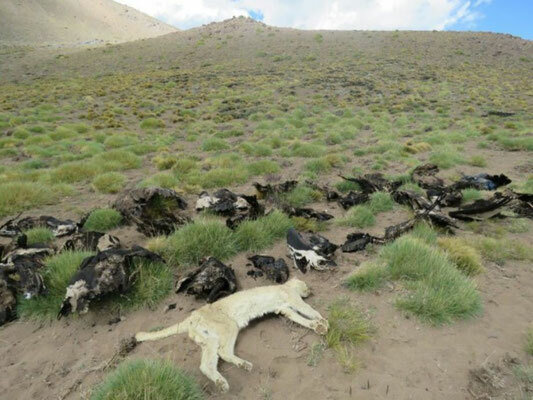 In addition to the birds, a dead puma and several farmyard animals (goats and sheep) were also found, suggesting that the poisoning incident took place when someone was trying to kill the predator. Sometimes people in South America also believe that Andean condors kill livre prey, which never does – condors, like most vultures, are only scavengers. Toxicological analysis are now being made in Buenos Aires.